The Tronsmart Element T6 Plus is coming soon! Take Part This International Free Tronsmart and Chance To Win Free New Branded Tronsmart Element T6 Plus. Would you like to get your hands on this powerful Bluetooth Speaker? Enter to WIN a Tronsmart Element T6 Plus Stay in the loop! Get product launch notifications. There Total 40 Lucky Winners to get Free Tronsmart Element T6 Plus. 4. 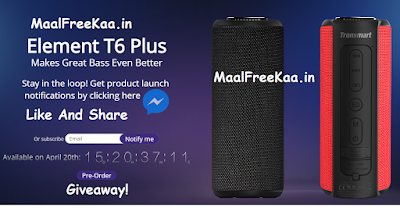 40 Lucky Winners Win Free Tronsmart Element T6 Plus Bluetooth Speakers. Say Hi to Tronsmart via Facebook Messenger to enter the giveaway. 2. Second, if the shipment can not deliver to your country or location, you'll lose the qualification to win the prize. The more entries you have, the higher the chances you will win. 40 Winners will be randomly chosen and announced within 48 hours after the Giveaway ended at 11:59 PM 23th April 2019 (Pacific Time). The winner has 72 hours to contact us via Messenger to claim the Prize.